Missed a Souvenir at the show? Don't worry - you can get it here! 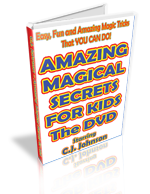 Learn Magic the Easy Way - by using Amazing Magical Secrets for Kids the DVD. 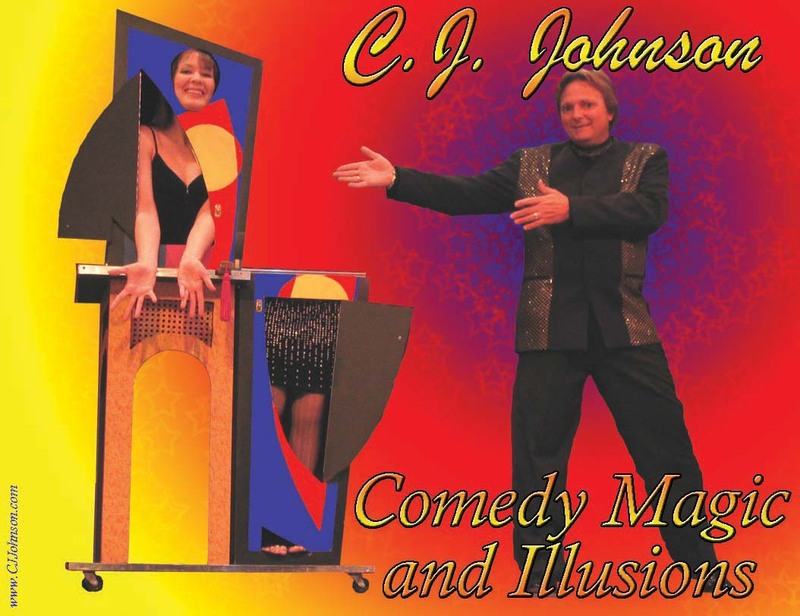 Includes instructions for 12 easy to learn, but amazing magic tricks, fully explained by CJ Johnson. Makes a perfect gift for that special child just getting started in learning about magic. $20.00 - online special only $15.00. color photograph of C.J. in action with the wringer box illusion. This picture was taken by Fort Worth Photographer David Thomason. All of the effects were done "in camera". David is a very creative guy, if you're a performer looking for interesting pictures contact him. This color picture is $5.00. 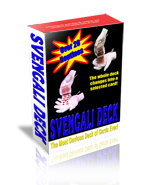 a simple card trick that you can be doing in minutes with only a little bit of practice. It's afun trick that's easy enough for young children to do, yet it'll still fool them! Only $2.00. This trick is fully explained on the Amazing Magical Secrets for Kids DVD. 24" x 17" full color poster of C.J. and his assistant Laura performing "Modern Art", an upright cutting in half illusion that is one of the highlights of C.J. 's illusion show. C.J. 's Super Magic Fan Pack! Amazing Magical Secrets for Kids! This book, formerly available only at C.J.’s live performances is now available here. The book includes 65 tricks that you can do with items you have around the house. It is designed for the elementary school aged child, but is fun for any age! Autographed on request. Book is center stapled and measures 5 1/2 x 8 1/2 and is only 5.00 postage paid. 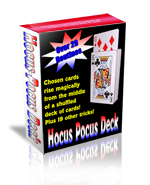 This trick deck of cards enables you to do 20+ different effects, including having a selected card visibly rise from the center of a shuffled deck! Very clever and versatile - very easy to do!